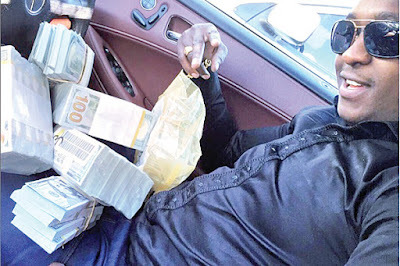 Many have questioned about the source of wealth of 28 year old Billionaire Steve Mbogo of which he declared via an interview by citizen digital that he is a board member of Faulu Micro Finance, Also a board member of the famous airline fly 540, also the lad claims to own 12 4-star hotels in Kenya, 32 apartment blocks in Nairobi, 2 Insurance companies in Uganda, Six night clubs in Nakuru, Kisumu and Nairobi and a flight training academy in Wilson Airport. Well could this be a hoax? Two companies have already disclosed to the public that they are not in any way associated with Steve Mbogo. 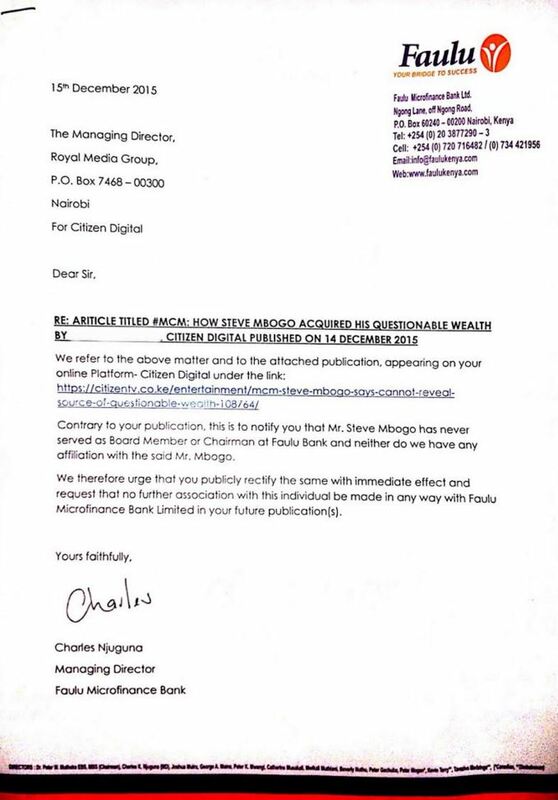 The famous airline company flight 540 claimed via an email to Nairobi news that they they have nothing top do with steve and they know nothing about him and they also threaten to sue him for passing off. Well lack is not by his side as another institution has come to the lime light claiming Steve has never in any way been involved with them. 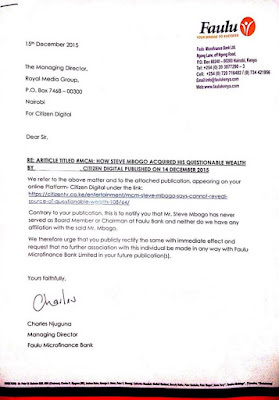 Faulu Micro-Finance Manager Charles Njuguna sent has wrote the letter bellow urging citizen Digital to pull down claims that steve Mbogo is a board member of the micro-finance as published in the citizen digital website.